The Phillies Nation Top 100 continues today with #53. Our mission is to assess the Top 100 Phillies players of all time using impact to the Phillies, individual achievement, team achievement, traditional stats, and analytics as our criteria. The list was compiled by Ian Riccaboni and Pat Gallen with input from the rest of the Phillies Nation staff. Please check back tomorrow morning for #52. Jayson is a young outfielder with a combination of power and speed. He’s had some injuries over the past couple years, but we think he has tremendous athleticism and we’re very happy to have him in a Phillies uniform. He’s a great addition to the club. Werth entered camp as the fourth outfielder on the Phillies, penciled in behind Pat Burrell, Aaron Rowand, and Shane Victorino. In 304 plate appearances, Werth played about as well as a part-time player could have played, hitting .298/.404/.459 with 8 HR and 7 SB, contributing to the Phillies reaching the postseason for the first time in 14 years. Entering 2008, Werth entered camp competing with Geoff Jenkins for the starting right fielder role. The veteran Jenkins won the job out of camp but Werth would end the season the starter, hitting 24 HR with 20 SB, becoming one of four Phillies to hit at least 10 homers and steal 10 bags that season. In Werth’s second postseason, he delivered in a huge way. Werth would hit .444/.583/.778 in the 2008 World Series en route to the Phillies’ second World Championship. 2009 would be Werth’s breakout campaign, hitting 36 HR with 20 SB, making, to this date, his only All-Star team. The Phillies may have fallen short in the 2009 World Series but it was not due to Werth: Werth would hit seven homers in the 2009 postseason, including a two-homer game in the pennant-clinching Game 5 of the 2009 NLCS and a two-homer Game 3 of the 2009 World Series. 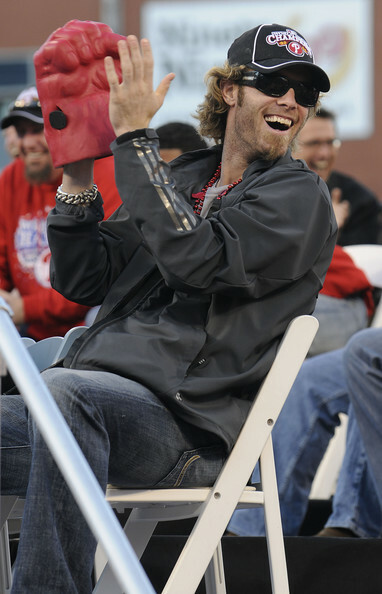 Werth would have an even-better 2010, hitting .296/.388/.532 with 27 HR and 13 SB, cementing himself in Phillies lore. Werth wound up 15th all-time among Phillies’ outfielders in OBP, seventh in slugging, 15th in wOBA, and ninth in OPS. Werth was an elite outfielder in his brief four-year stay in Philadelphia, ranking as the second best NL outfielder according to FanGraphs’ version of Wins Above Replacement level, ranking third in OBP, sixth in slugging, and fourth in OPS. Because of his elite postseason performance and Werth’s stay near the top of the advanced statistic food chain, Werth is listed among the 100 greatest Phillies of all-time.